To capture the best feeling of a scent on paper, you have to smell it in a neutral environment – meaning you’re not overwhelmed with other smells. It’s then a great idea to ‘live’ with it, applying it on different body parts and at multiple points throughout the day, so you get an overall impression of the scent and how it evolves; Karine recommends spritzing your clothing and body parts that have different temperatures (i.e. neck, arm, wrist) so you can fully understand how it evaporates and lingers. A first impression is not enough, as fragrance continually changes and evolves. imagine.” We naturally understand the description of rose more than we can an exotic flower picked at the height of the moon, so bring the fragrance to life using easily understood descriptors. Fragrance impressions are so intrinsically linked with memory, because this is the way we process that olfactive information. We find it hard to verbalise what we’re smelling, so we relate it back to an experience or memory that’s easier to describe and understand. I often describe perfumes as “like a warm Italian summer’s day” or “a comfort blanket wrapped around me on a chilly autumn afternoon” because it’s far easier to illustrate the feeling a scent leaves than attempt to get too technical. Describing the overall impression and feeling that the perfume releases is an effective way of appealing to a reader’s emotions and meaning they simply must smell it. Karine Dubreuil-Serini describes ‘By Invitation’ beautifully, using each of the four elements that make up the perfect description: “Like Michael’s music, the fragrance is modern and transcends time and fashion. A feminine and elegant accord has been created around a glamorous rose, the iconic love flower, treated in a natural way thanks to a floral harmony revealing a mischievous lily of the valley, a wild jasmine and the spicy and transparent inflexions of peony. The floral bouquet is dressed with tempting red fruits and radiant bergamot shades, while the oriental base is an addictive praline vanilla wrapped in a warm sandalwood-musks duet – like the mellow voice of Michael.” Doesn’t that make you want to spritz it immediately?! So the next time you want to describe or write about a scent, why not break it down into these four different elements and see how your words and thoughts stir the emotions and actions of others. Previous Post Understanding Fragrance Lingo: Do You Know The Difference Between An Eau De Parfum & Eau De Toilette? I think this is a really good point to make. Fragrance is definitely very difficult to write about. 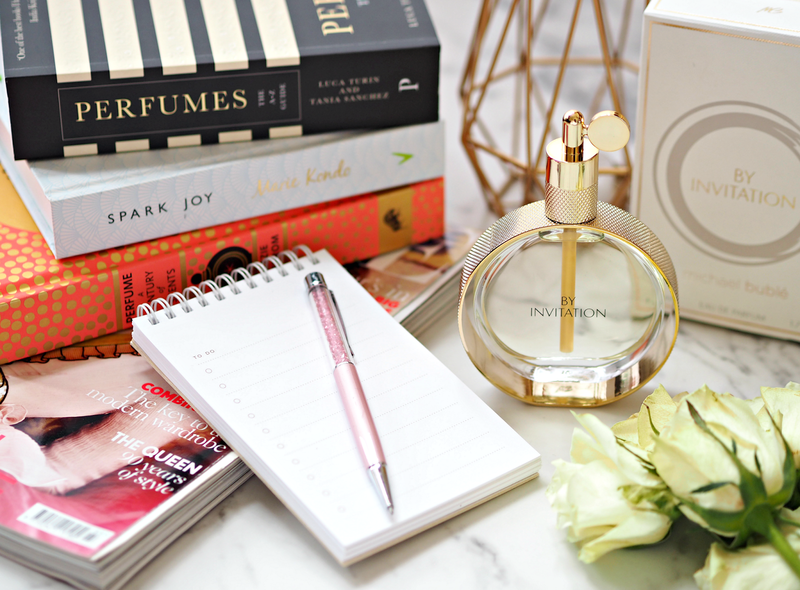 I know I find writing perfume reviews pretty challenging, but in a way that's why I want to do more of them – taking the easy path is just too boring and predictable. Writers need to keep stretching themselves to grow and develop, and writing about something that's hard to describe is a great way to do this. Absolutely Joanne. I find it hard to write about scent, but equally it's incredibly satisfying and creatively liberating to do so.